This was originally posted for The School of Gypsy Arts Newsletter for the quarter and I wanted to share it here. If you are in the Vancouver area there are many events, classes and workshops on offer on the Gypsy School site and bookings for the next fair are open. The Autumn Equinox the second day of the Wheel of the Year where day and night are of equal length. The tipping point of light and dark where one hemisphere starts the transition into long cold nights and the other starts to rejoice in the returning light. Balance in both. Mabon is the second harvest where we give thanks for all that the seasons harvest has given us and when we prepare for the darkness of winter. We are called to take stock of what we have achieved so far in the year and can realign goals for the remainder of our year. In reflection we can take a look at where we are and adjust our course for future success if needed or just keep going if we are on the right track. Have a thanksgiving dinner on the date of the original day of thanks. Cooking meals with apples, seeds, nuts, pumpkins, squash, grapes and corn go with the season. Get out in nature while you can and the day light is still favourable. A good hike to see the leaves slowly changing color or even a last swim before the water gets too cold. Clear out your pantry with canned foods that you are not likely to use and donate it to your local Food bank. Winter and the Holiday season coming up is the hardest for many families. Take it one step further and purchase some yummy non perishable foods to donate. Believe me when I say that Food banks get a lot of baked beans. Clear out you wardrobe, books, old toys and useable blankets and give them to other local charities. Make a cleansing spray and smudge your living space to move any stagnant energy. Cleansing your space before winter is another idea, allowing the energies to shift before a new season. A simple cleansing spray can assist your efforts and can be used when ever you feel inspired to. Take the spray bottle and put the crystal chips or mini stones in the bottle. Fill the bottle ¾ of the way with the spring water. Add two drops of each essential oil and shake. Remember to shake the bottle each time before use. To listen to the beautiful 30 minute recording Click here. All sacred holidays are great times to conduct any divination practice. Below is a Mabon Tarot Spread which you can also use with Oracle decks. 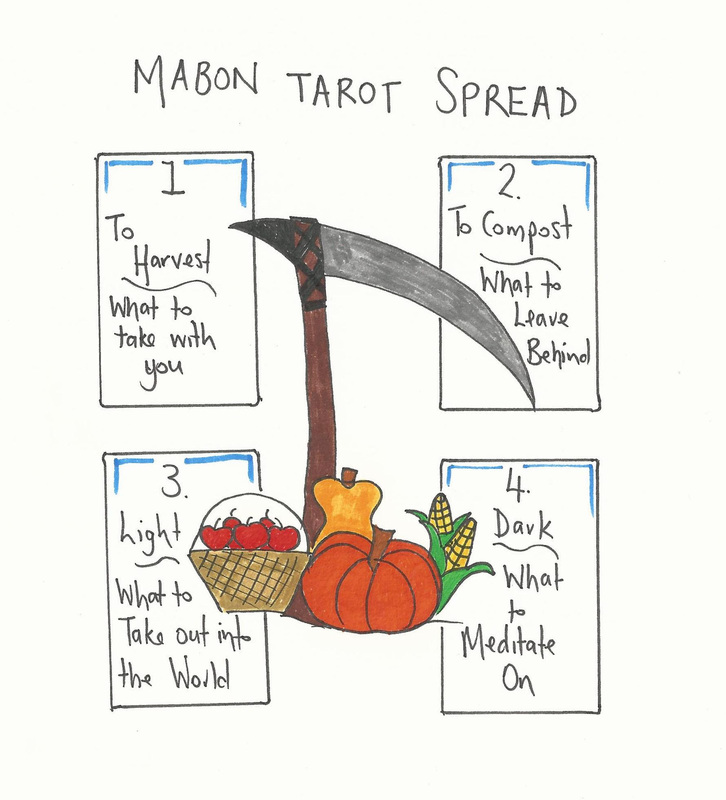 A simple spread which you can do on Mabon eve or anytime during the season. A couple of seasonal Tarot decks that you may love using for this Tarot spread. The Halloween Tarot and The Wheel of the Year Tarot. Hello! I was looking for a good spread to use during Mabon for myself and my loved ones, and this spread is perfect for what I was looking for! I wanted a spread around 4-6 cards which really tapped into the themes that are present for me during this season. This spread fits the bill nicely! Thank you so much.